Writing, writing, writing. Words, sentences, paragraphs. My fingers sing clickety-clack out loud as they dance on my keyboard. It’s a new week, new year and I’m busy in my home office. A few recent writing projects have kept me busy over the past few weeks (thankfully! ), but they’ve also kept me from my appointed rounds here at The Blog. The holidays have come and gone, and as usual they flew past before I had time to fully immerse myself in all the festivities. I did, however, find the time to indulge in plenty of calories — both solid and liquid, thank you very much. Now, on this sunny but very cold day, a tiny glimpse of spring just peeking around the corner like a giggly toddler playing hide-n-seek has me thinking I should be moving my legs instead of my fingers. Calories taken in must be calories sent packin’. Resting my chin in my hand, I stop to ponder, yet again, my next sentence, my next move, my next life. And that’s when I heard it. The soft murmur of the panettone bread pudding leftovers calling me from the cold, dark fridge 30 feet away. Why is it that comfort food speaks louder than the carrot sticks and apples sitting smugly in the back of the fridge? Why don’t I ever hear their uppity little voices calling out to me? Because they don’t care if I notice them or not, that’s why. They are unsociable, despite their appearances at parties everywhere. Veggie sticks and fresh, healthy fruit slices don’t know how to have fun — not without some help from dips and such. They have few friends — usually only other foodie outcasts such as rice cakes, naked celery (no peanut butter), and bottled water. And they wouldn’t know an indulgent moment if it hit them in the face. . . . if they had faces, that is. But I digress. I started out the day with black coffee, followed by a mixed berry yogurt and my homemade trail mix: plain walnuts, beer nuts, dried cranberries, and bittersweet chocolate chips. (The beer nuts were a last minute substitute for the plain almonds at the top of my grocery list.) I felt the meal was, in the grand scheme of things, a semi-healthy one, given the antioxidant and other good-health accolades of the cranberries, walnuts, and dark chocolate — and the fact that I had earlier thought about turning the cut away crusts of the panettone into decadent French toast with warmed maple syrup and a dusting of powdered sugar. I could have gone there, but I didn’t. I could have been really, really bad, but I wasn’t. Because, let’s face it, if I’m having panettone French toast, I’m going to add some bacon slices to the menu so the salty offsets the sweet, syrupy, eggy bread. Just rounding out the flavors. I will not be led to failure by refrigerated bread pudding! It is nearly lunchtime, so maybe I’ll opt for a tuna sandwich or cup of soup. Somehow, with the melodic beckonings from the leftover bread pudding still resonating within my brain, tuna doesn’t sound so appealing. Instead, I compromise. One tiny piece of the panettone bread pudding in exchange for 30 minutes of dancing to the oldies in my living room and one 30 minute dog walk. That should do it. Compromise is good for the soul, I tell myself. And so, too, is the delightfully decadent Italian powerhouse waiting for me in the fridge. 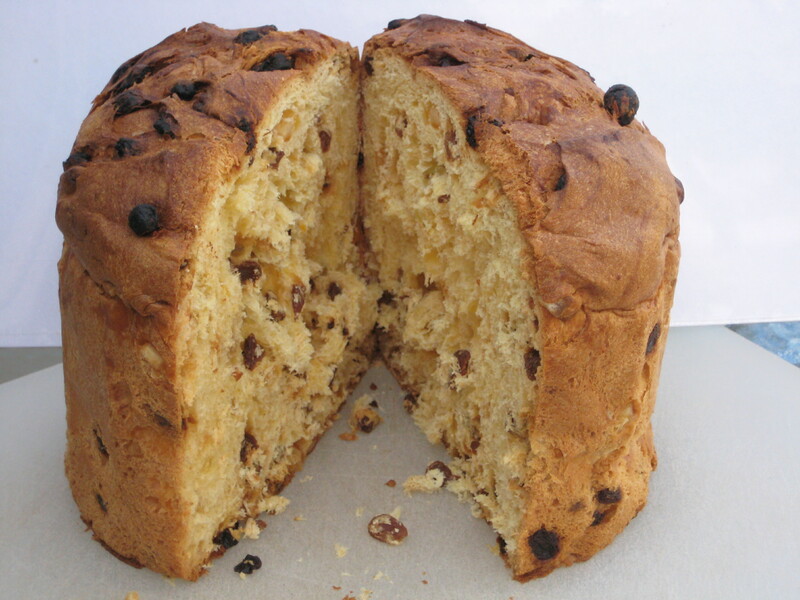 Panettone -- a fragrant, sweet Italian bread perfect for French toast or bread pudding. Panettone is not your average bread item. First of all, it comes wrapped up like a Christmas present. You gotta’ love that. And it has an aroma like nothing I’ve ever known. It is so fragrant that simply removing the tight paper wrapper releases the exhilarating charm of this fruit-studded, delicately sweet, soft-as-silk bread. The good thing about a compromise made between me and me is I’m unable to skirt a deal made with myself . . . because I wouldn’t stand for it . . . I’d hold me to it . . . we shook hands on it, you know. Whatever. 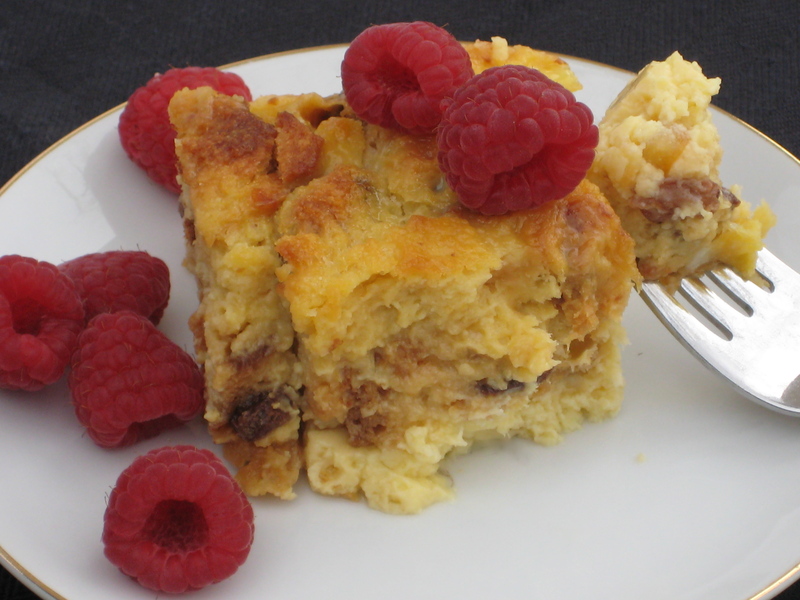 My mother used to make bread pudding with raisins that was warm and filling and creamy good. But when I tried Giada De Laurentiis’ recipe for bread pudding, well, it took the old fashioned dessert of my youth to another level. It’s the panettone that does it. Of course, in true fashion, I added a little something to the recipe and left off a little something. More compromises. Once the 30 minute exercise deal has been met, it’s straight to the fridge for my payoff. Then a walk for the dogs before getting back to the keyboard. Clickety-clack, clickety-clack, clickety-clack . . . All in a day’s work. Lightly butter a very large, oblong baking dish. (Mine is about 10 x 13 x 2.) Arrange the bread cubes in the dish. Bake at 350 degrees until the pudding puffs and is set in the center, about 45 minutes. Allow to cool slightly. Spoon the bread pudding into bowls and serve with fresh berries, freshly whipped cream, or Giada’s cinnamon syrup (see her original recipe). This entry was posted in Brunch Favorites, Comfort Food -- Sweet, Desserts and tagged bread, brunch, compromises, custard, Food Network, French toast, Giada De Laurentiis, holidays, Italian, Panettone, pudding, specialty foods, writing. Bookmark the permalink. I just wanted you to know that I think you’re a wonderful and talented writer and cook. I’ve sent your link to several friends, and they also really enjoy what you’re doing. Just wanted you to know that I’m following along. Best of luck. Many thanks, Marla, for your kind remarks. So glad you stopped by!